I mentioned before that my tween daughter just loves to make things. My son, however, is not the craft type. He likes to make “cool stuff” and do science projects and build things – but if you mention paint or glue he runs the other direction. To battle this, we’ve found some of our all time favorite crafts for boys (that don’t like to craft). I promise they will be totally into making these awesome projects! If your boys are anything like my son then he is totally into anything that has to do with bodily functions. He will love making is own Fart Putty or this awesome Fart Noise Maker. Yes, I know, disgusting – but he will be entertained for hours making some lovely noises. We also love to build things around here. You can appeal to their engineering side with a Mini-Robot – yep! He really works! Or have them create a Balloon Rocket to launch! If they are into Ninjas, Soldiers, and all things weaponry the boys will love to make a Popsicle Stick Bow and Arrow, a Tiny Catapult, or a Marshmallow Shooter! My son loves to launch things – especially at his sisters – so these are a big hit. And what boy doesn’t love Bouncy balls and Rock Candies? Especially when you can make your own! What fun science crafts that have a really cool outcome. Some other fun ideas are these Pipe Cleaner Ninjas, Juice Box Boats, and Beaded Lizard Key chains. 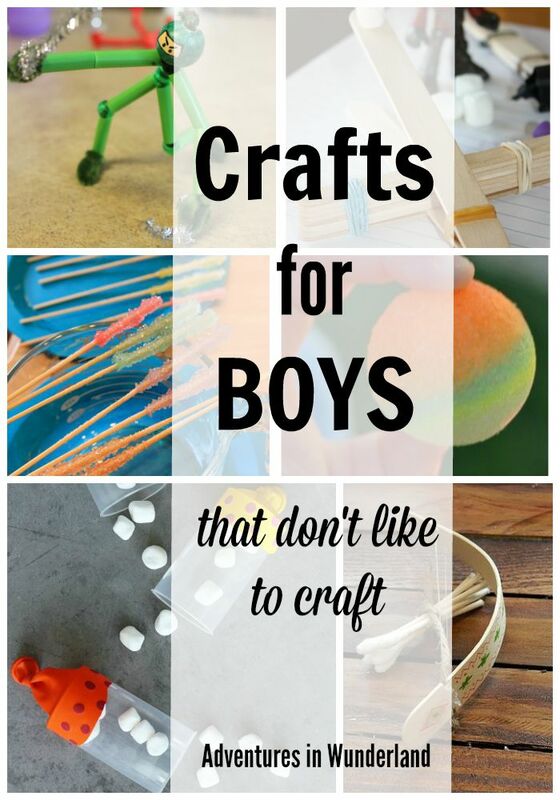 Do you have a favorite boy craft? Or maybe a fun science or engineering craft? We’d love to hear about it!